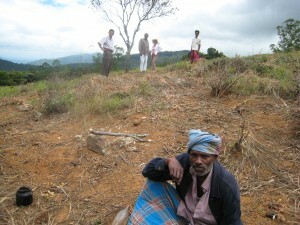 A record drought has hit hard in Sri Lanka causing more suffering for farmers and a decrease in hydro-electric power. Unfortunately, our 10,000 tree reforestation project was launched at the same time as the drought started and we have experienced a 50% failure rate with our new tree plantings. We have now established micro-nurseries run by villagers to help provide new tree starts that will be used to replace the dead trees. The good news is that we are able to employ the local workforce to maintain the 10,000 tree goal. Once these fruit-bearing trees reach maturity in about five years, the village will have a new revenue stream and the economic transition from tea to fruit will take place. The blueprint for the reforestation project was designed by both the local community and the local university Agro-forestry Department. Dr. Gamini Hittinayake is a senior lecturer of Agriculture at the University of Peradeniya and a consultant for the Community Friends land restoration project in Waitalawa. We are very fortunate to have Dr. Hittinayake’s expertise. We are now hoping that the drought will be over with the coming of the next monsoon. With the ground prepared, holes dug, fire breaks established, contour drains cut, the planting of our 10,000 is officially ready to commence. 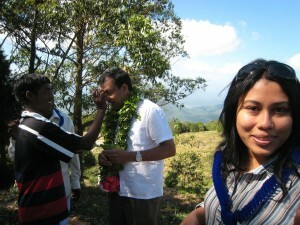 The work of planting trees is being supervised jointly by KP, Dr. Hittunayaka, Jeewa, Deva and Seevali. Working through KP, we have arranged for tea pluckers from the local community to mount the massive effort to get the trees into the ground during the present wet season. As this planting window could be very short, the whole crew is working long hours to make this happen as quickly as possible. We anticipate that within five years, the fruit-bearing trees will begin to mature and the village can begin the transition from tea to more nutritious crops. Certainly this transition will benefit the villagers who now live in poverty and cannot even afford to buy the tea they grow for the factories. As we await the coming of the rain, the local villagers are holding a blessing ceremony on the land as a way of assuring our success. The whole community is now behind the effort and we are happy to be a part of their world. This occasion included good food and a large turn out of our friends and workers. KP supervises ground preparation for tree planting. Community Friends’ board is pleased to announce that a source for bridge funding been found that will pay for the purchase and planting of 10,000 trees on the land to be reforested in Sri Lanka. Work is about to start, preparing the land itself – which means clearing weeds and tangled surface growth, digging contour drains to help stabilize the hillsides and improve the land’s water retention, and digging 10,000 holes. We will also be starting a local nursery so that as many of the 10,000 trees as possible will be grown by micro-entrepreneurs in our community. We are also pleased to announce that Dr. Gamini Hittunayaka, of the University of Peradenia, has offered to provide us with technical support in guiding our many choices and strategies for this program. Thanks to all for your generous support! 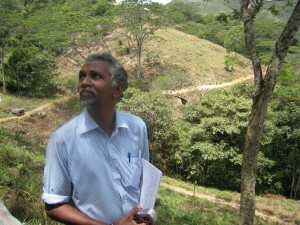 This month we are meeting in Kandy, Sri Lanka, to hear a proposal for the land revitalization. Decades of tea production have deeply impacted the soil and wildlife habitat here, leaving nothing but crystalline dolomite where once a verdant forest stood. Steeply sloping terrain combined with torrential rains during two seasonal monsoons have further contributed to the decline of topsoil deposits. And, once again, we are confronted with a local population that seems to be held in poverty by the jobs they cling to – tending and plucking tea. 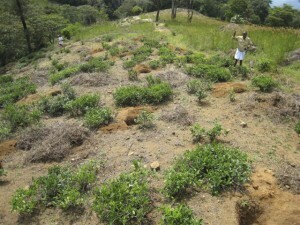 The proposal that we are considering is this: transition the land away from tea towards agroforestry. 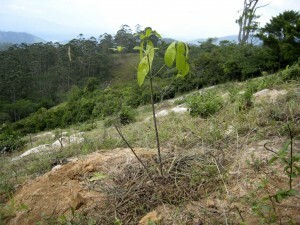 This means replacing the tea plants with fruit-bearing trees. In this way, we can help stimulate the local economy with fruit production while at the same time repairing the land by creating greater biodiversity, a return of native species, and through the elimination of chemical fertilizers. The proposal is to plant trees during two or three rainy seasons, so that the young trees freshly planted will have abundant water and a weaker sun to contend with. The idea is to attempt to plant 10,000 trees including mango, jack, mara, avocado, sabukku, sapu, toona, as well as many others. The trees are to be selected and mixed in such a way as to support the reemergence of full biodiversity. For instance, some trees find it acceptable to establish themselves in very poor soil and harsh sunlight. These will be the first wave. Then, once they are established somewhat and the soil is stabilized by their presence, a second wave of trees can be attempted. After that, understory and other plants that encourage wildlife, by providing forage, shelter, etc. In order to obtain funding to get these first 10,000 trees started, we are looking at Carbon Offsets from the trees themselves. 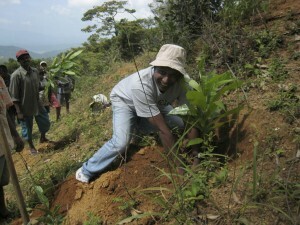 This will require support from the agricultural experts in Kandy – fortunately Geeva will help us make that connection. It is our estimate that within 7-10 years of planting, we will start to see a reasonably-sized fruit crop that will be the true economic engine to help support the local population. 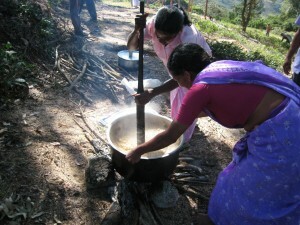 When Community Friends’ Sri Lankan partner acquired a 40-acre tea plantation in the high-elevation cloud forest, we did not fully realize what we were taking on. 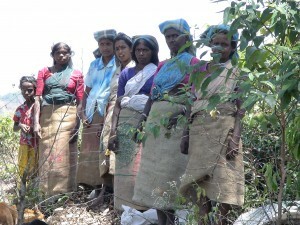 I was hiking on the land, following a wild boar trail and noticed barefoot Tamil women with burlap sack skirts picking tea. I said to our guide, “Who are these women?” He explained, “They work for you.” A bit startled, I then asked, “How much are we paying them?” The going rate seems to be about 25 cents an hour. I did not realize that when we acquired the land, it came with a village of 50 families who have worked this tea plantation for five generations. All they have known from British colonial times is working for the “master.” And now we are the new masters. The first tasks were to establish a living wage, provide health care and install a micro-hydro generator for electricity. We began to convert the tea to an organic plantation. However, we realized that the tea industry is oppressive for both the people and the land. We decided to begin a transition from tea to fruit-bearing trees that could become a major income stream for the village. Financing the economic transition requires upfront money since the newly planted fruit trees will not be producing for a few years. 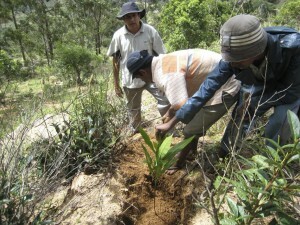 We decided to sell carbon offsets based on the carbon absorbed by the newly planted trees. 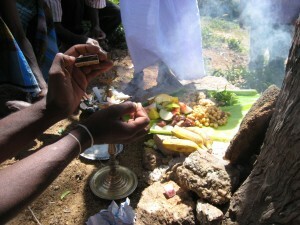 The sale of these offsets to people in the USA provides the financing to transition the village economy from tea to fruit. The longer-term concept is to allow the villagers to replace the master. In the future, we anticipate that we will be able to transfer ownership of the land to a land trust managed by the community.